In a news conference streamed live on WFMZ.com, authorities announced the federal indictments of eight people who allegedly participated in a violent drug trafficking organization in and around Berks County, selling methamphetamine, heroin, fentanyl, and crack cocaine. >>message to any other groups with in berks county that the federal government is here. And we're not going away. >>the feds are indicting 8 members of what they call a violent multimillion dollar reading based drug ring prosecutors say they hope the move sends a message. Good evening once again i'm windy day and i'm rob vaughn first county's da calls this gang of the most violent drug organization he's ever encountered now the feds are trying to keep 8 members of the group. >>off the streets for good authorities announced indictments against 8 alleged gang members of firm's he's cut here winfrey has lived the berks county services center with more tonight. >>rob and wendy we're talking murder attempted murder attempted kidnapping and a wide variety of drug charges officials say that was the greatest mode of operation and if convicted they could face life in prison. >>8 suspects in a major drug trafficking ring known as trinidad etg have been federally indicted on 21 counts to says bin. >>the trump organization that we have ever encountered. >>the suspects are connected to an investigation. Authorities called operation shattered in march of last year berks county detectives arrested more than a dozen people and more arrests are possible. 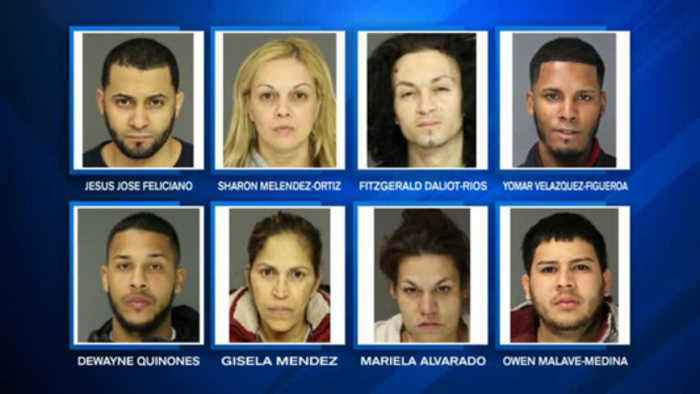 >>these are serious federal charges with serious federal penalties officials say hey says feliciano was the ringleader they say the group is accused of drug charges stemming from the sale of met heroin cocaine and more and if there's other groups who engage in this violence. They're also going to be brought to justice as well the indictment says the group kept about a dozen stash houses around reading in use various forms of social media to communicate about drug trafficking and violent act us officials say they seized an extensive collection of guns. >>in 2018 berks county had the highest homicide rate that it is encountered in over a decade. >>the district attorney says the game could be behind 7 or 8 of the last years homicide. >>and officials say based on the information collected through the investigation they were able to stop other planned shootings from happening. Reporting live in reading could euro winfrey 69 news.